All’inglese Drew Colby, per la prima volta in Svizzera, bastano invece solo le mani, suo strumento di lavoro, uno schermo bianco, le luci, ogni tanto il resto del corpo, un cappello, un foglio di carta, per creare un incanto visivo che ha entusiasmato l’affollata domenica mattina del Teatro Foce. In My Shadow and me gioca con la sua ombra, inseguito e inseguitore e poi dà il via ad un fantastico e raffinato zoo, animando cavallo, gatto, cane (in litigio, naturalmente), ma non solo piatte figure: hanno testa, occhi, lingua. bocca in movimento, oltre che zampe. E cerbiatti e uccelli, bestie di cielo, terra, mare… Con umorismo tutto british, gabbiani, colombe, papere, canguro e lumaca, gli uni partoriti dagli altri, con dinamica di mani e dita (impagabile il coniglio che mangia le carote-falangi, ad esempio). E dal cappello escono serpenti minacciosi, gag ironiche; la testa pelata dell’artista diventa il guscio di una tartaruga. E gioca anche con la duplicazione di se stesso. E poi ancora Pinocchio con il suo lungo naso. E dal foglio di carta, classici barchetta, aereo, cappello, toast. Si diverte anche interagendo con il pubblico e una pallina di carta. Fino al lirismo delle impalpabili creature di luce, concludendo con la visionarietà tricolore della danza di tre orsi, tre cammelli, tre elefanti e tre se stesso. Raccontare è impoverire, senza vedere figure e animazioni, ma Poletti sa sempre farsi nuovi amici e visto il successo, bimbi e adulti estasiati, siamo sicuri che tornerà al Festival. Dopo la riproposizione di uno dei suoi cavalli di battaglia, il festival Incanti regala invece una prima assoluta, “Cinema in silhouette”, del britannico Drew Colby. L’ombra, si sa, con i suoi capricci chiaroscurali, detta legge in fotografia come nel cinema, e la mente del cinefilo non può che riandare con devozione al giganteggiare di Orson Welles sulle mura della Vienna de “Il terzo uomo”, allo spettrale simulacro del “Nosferatu” di Murnau o al presagio di insidiosa minaccia racchiuso nella silhouette del predicatore Harry Powell ne “La morte corre sul fiume”. Colby conduce il pubblico in un viaggio di millenni a ritroso nel tempo, risalendo letteralmente alla preistoria del cinema, e suggerendo la fantasiosa ipotesi che l’ombromania sulle pareti delle grotte possa essere stata la prima forma di narrazione elaborata dall’uomo attorno al fuoco: gli albori delle ombre cinesi, insomma, che nel caso di Drew Colby sarebbe forse meglio definire ombre cinetiche. Sì, perché Colby non si limita a un esercizio virtuosistico di stile, a uno sfoggio di elasticità manuale, proiettando sulla tela i classici, statici contorni di animaletti o monumenti architettonici, bensì dà vita a vere e proprie sequenze, come la spettacolare corsa del coniglio inseguito dal lupo – che restituisce l’illusione di un vero e proprio montaggio alternato – o il fenomenale duetto canoro con Frank Sinatra. Colby ricrea il cinema delle origini nella sua sostanza più pura: immagini in movimento; e con il solo ausilio di qualche famosa colonna sonora registrata, riproduce in carrellata le scene più iconiche della Settima Arte, quelle impresse ormai indelebilmente nell’immaginario collettivo. L’autore non si nasconde come di consueto dietro lo schermo ma si vi si pone davanti, mettendo il proprio stesso profilo in dialogo con le proprie creazioni, e ritagliandosi un ruolo di scanzonato stand-up comedian che ironizza sui profili presidenziali americani, condisce di aneddotica autobiografica la performance ed invita persino la platea a una riflessione più teorica sulla natura effimera ed estemporanea dell’ombromania, una tecnica marionettistica che non genera alcun artefatto, ma vive fra i battiti di ciglia, consumandosi nel respiro di un momento e non lasciando alcuna traccia di sé. L’inevitabile stilizzazione su cui si fonda questo teatro povero e minimalista, con le sue figure appena accennate e sbozzate, fa sì che lo spettatore sia investito del compito stimolante di identificare le caduche esecuzioni prima che queste si dissolvano, e prima che le mani dell’artista, da vere primedonne, si inchinino a ricevere gli applausi. Drew Colby's charming "Me and My Shadow"
Drew Colby's hand shadowography was entrancing and like nothing I’ve seen before. It had me watching with true awe. On stage his personality truly shined through, allowing me to relax and be amazed. It was especially fun to play 'guess the film' as Drew took the audience through some familiar hollywood favourites. The winner had the chance to go on stage and learn some “hand-ography” themselves- definitely making me realise it's much harder than it looks." A bare stage with a small light projecting onto a large blank screen. 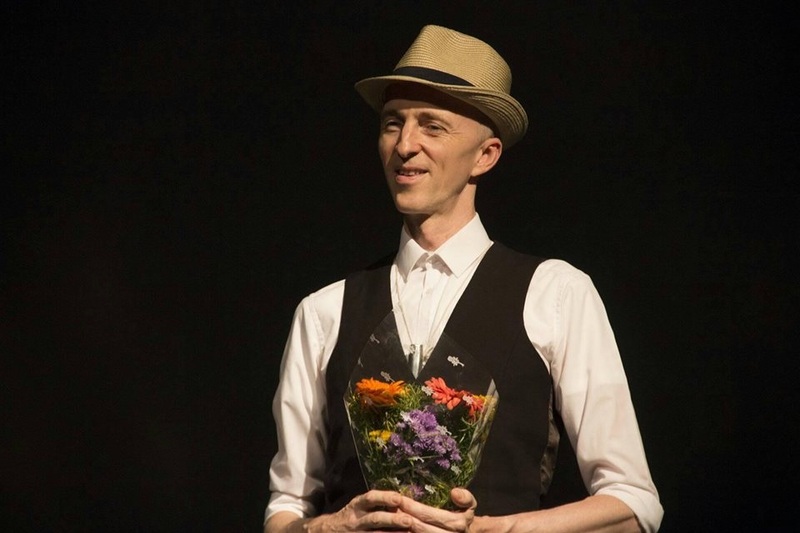 The audience of young children and their parents in Theatre Utopia sits in anticipation as a lanky young man in a trilby crosses the stage, smiles and the lights go down. This time, as he crosses in front of the light, his shadow appears behind him. Cue a lovely pantomime-like sequence in which we see his shadow but he doesn’t: “it’s behind you!” squeaks an excited little voice from the audience. And then the magic begins. 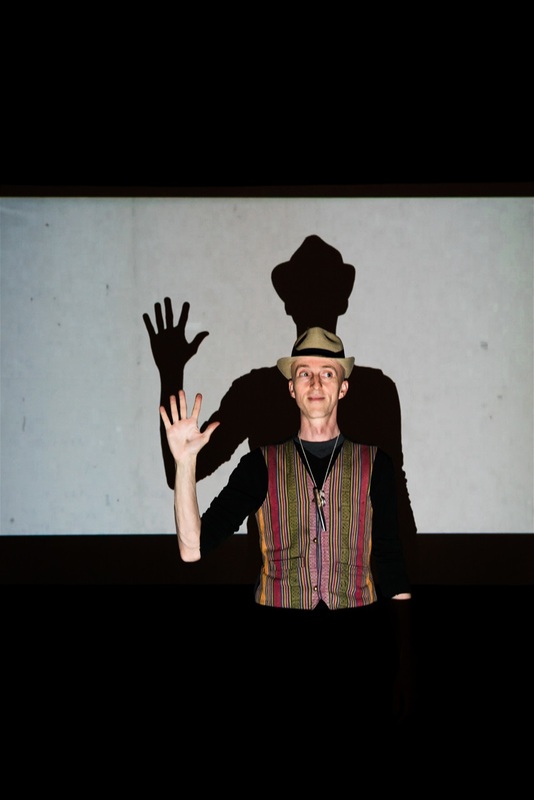 Drew Colby, hand shadowgrapher, uses his hands, fingers, his own profile, his arms, a kazoo and some string to create a host of creatures from crabs to rabbits and elephants, other people and monsters. Sometimes they appear in their own world, and sometimes his profile interacts with them. Should you be able to tear your eyes away from the screen, you will see that Mr Colby is as interesting to watch in the act of creating his on-screen world as are his shadow creatures. He commits totally to the vignettes he creates, using only a few words and lots of expressive sounds. He also sings his own soundtracks – the adults in the audience appreciated the musical nods to the Lone Ranger theme as he rode his shadow horse and even at one point referenced ET! This show never condescends because it’s ‘just for kids’. Here is a performer at the top of his game, who has a fertile imagination and meticulously crafted technique. He seems to have more than two hands as he creates birds which morph into swans which become something entirely new. He uses cartoon gags, like big animals eating little ones, then the little ones escaping via a colourful regurgitation – which the children love. He never stays in one story context for long, switching – as children so often do when they play – from one story to the next with no need for a logical link. The result is free-form fantasy, and utterly enchanting. A highlight for me was Mr Colby’s use of a torch held in his mouth to create a glowing ball which was bounced by a shadow bear. If I had one tiny gripe, I would say that the forty-five minute show could have been reduced by ten minutes. There was repetition of a couple of gag sequences, which while great the first time, possibly didn’t need repeating. However, the hula hoop at the end (you have to see it!) was a fittingly anarchic finish. It was an utter joy to indulge my inner four-year-old for forty-five minutes on a Saturday afternoon. The four year olds clearly thought it was pretty good too. We had Mr. Drew Colby visit us from distant London yesterday. While we ourselves are involved in warding off the pressure of an unknown language here, this man did not require any language to communicate with us. He was able to communicate with very simple English which all of us understood and with the help of his shadowgraphy, he took us to another world. With the help of a white screen , a light and with the help of his slender fingers, he took us to Giza, West Africa, Arabia and other exotic locations in a span of an hour which no aircraft would do. The child in me woke up and the same held good for the rest of the audience. He brought an entire bus load of animals to life with accompanying sounds. I would watch this show 10 times more if I had a choice. This was on the occasion of the International Theatre festival to mark the birthday of Mandya Ramesh. And what a day it was. I really wish we could celebrate his birthday everyday if it meant showcasing talents such as Drew Colby. I'm hoping this becomes an annual event and Theatre festival to mark the same comes on par with Bahuroopi if not surpass it. Lastly, come back to India soon Mr.Drew Colby. Thank you Mandya Ramesh sir for the wonderful show. 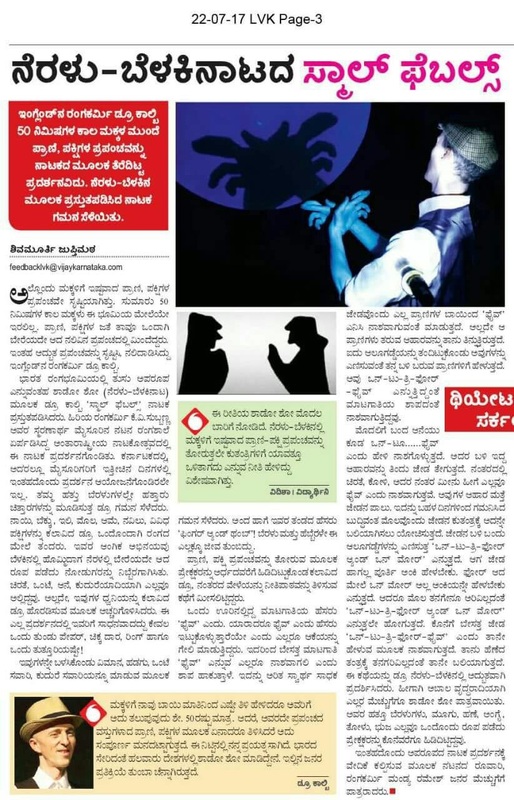 Thank you Beesu Suresha sir and Rangashankara. Will remember this for long. 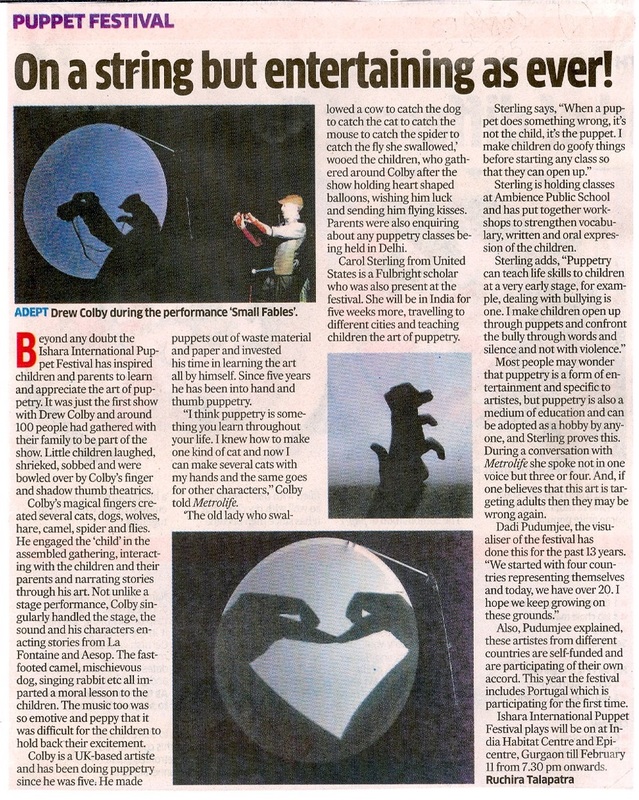 "Drew conjures up enchanting images"
Drew Colby’s work with puppets in South Africa and the UK has evolved over 30 years. He began with glove puppets and marionettes at the age of 12, gradually becoming interested in what the everyday object could say. 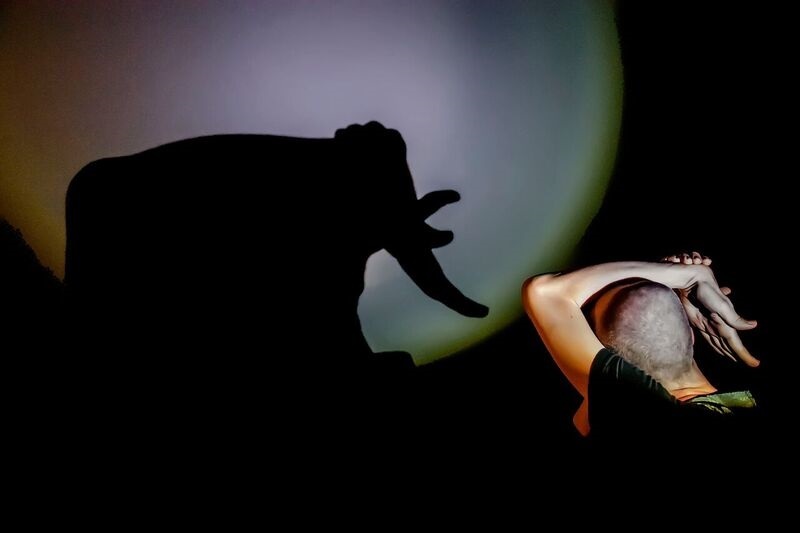 Finger and Thumb Theatre began life in 2002 as Objects Dart, a puppet company founded by Drew to explore the use of object theatre in conjunction with traditional puppet forms. 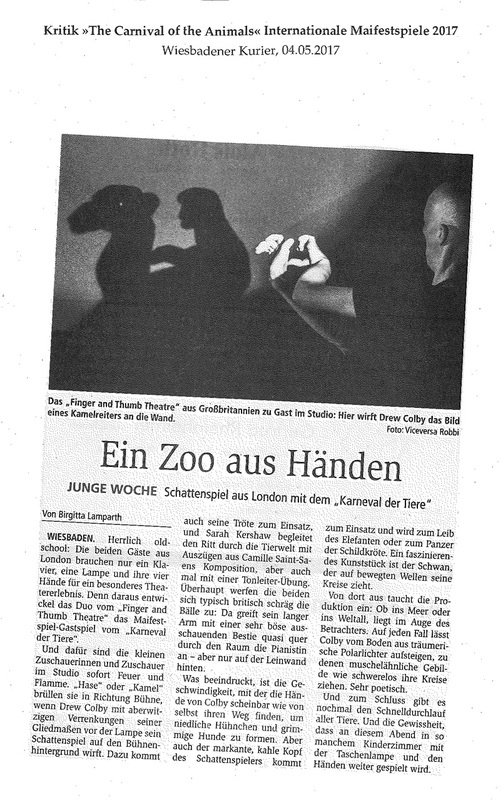 From 2002 Drew created fourteen different shows, evolving a style of object puppetry that was described by audience members as “instant puppetry”. 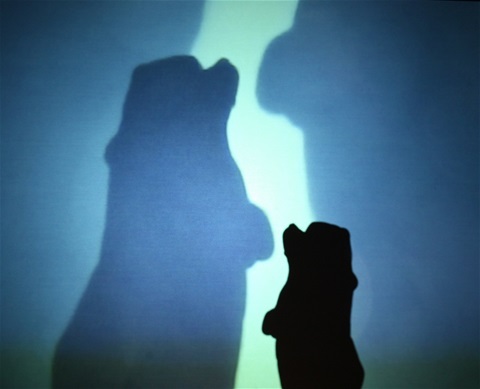 In 2010 Drew began to focus on hand shadow puppetry, Finger and Thumb Theatre which creates visual shows for family and adult audiences using different combinations of hand shadows, video technology, live and recorded music, storytelling and songs. This winter, Dulwich Picture Gallery is hosting Drew’s latest show “Carnival of the Animals”, where Drew conjures up enchanting images and stories with his hands. Accompanying Drew’s hand puppetry is a pianist; the music bringing a change of mood and pace to the performance. As the lights begin to dim, it is the younger children who seem unsure, perhaps because of the darkness creeping in or uncertainty; the fear of the unknown. The older children sense the comedy of the initial interaction between the puppeteer and the pianist, cackling out loud and pointing as if to share with their parents their discoveries. When a mummy kangaroo kisses her baby kangaroo on the head, there is a collaborative “awww” from the audience; the children show their capacity to empathise, to feel the emotion of the moment; appreciating the significance of the relationship. Small spots of ethereal light begin moving up the wall and across the ceiling, projected by Drew and using a torch shone on a piece of agate. Children marvel at the sight, “it’s snow….bubbles…stars“; their imagination running at full pelt. A single circular shape then appears on the screen and a child explains “there’s the moon“. The child’s intonation suggests a degree of familiarity, a state or knowing; as if they are referring to an old friend. When the puppeteer begins moving around the room searching for a cuckoo in the woods, the younger children imitate Drew, calling out “cuckoo…cuckoo”, helping him in his hunt, sensing the importance of finding a new friend and recognising Drew’s loss. As Drew begins the aviary section of the performance showing the flight of a bird across the screen, older children at the front of the group begin to imitate the puppeteers hand formations, holding up their hands towards the screen, opening and closing their fingers in a flapping motion. 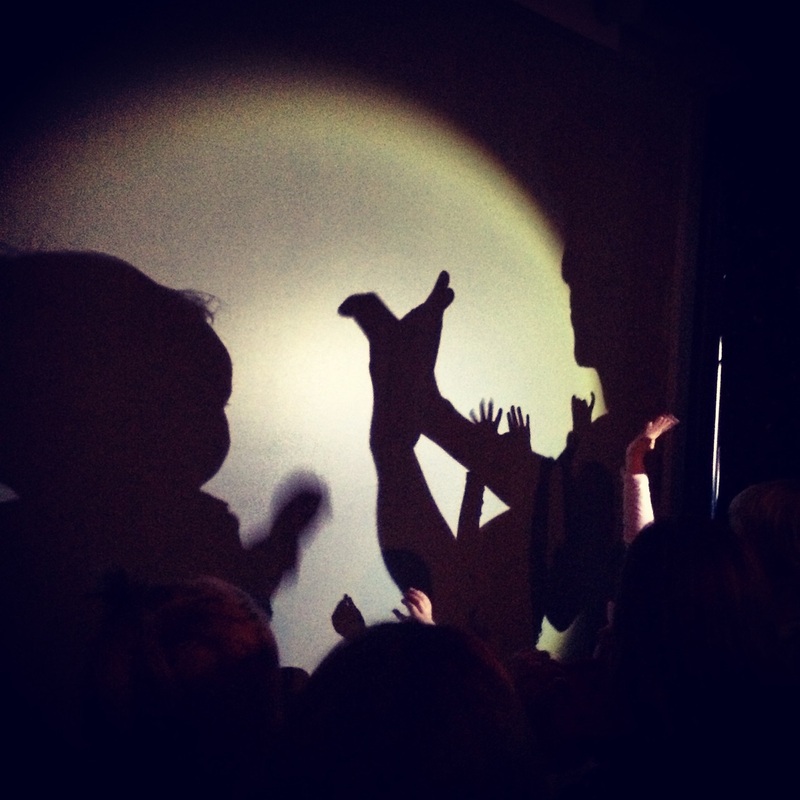 Towards the end of performance one child begins to make marks on paper with a pen telling their mummy “I am drawing around my hand.” Is the child inspired by the shadows and attempting to replicate the concept, the outline of her hand representing its shadow? Making a connection to the relationship between the shadow and its subject? It may look simple but there's plenty of technique involved here, and it relies a lot (as Colby admitted) on "muscle memory". But this affable shadowgrapher brought it off with brio and a sense of fun that the audience - both adults and kids - easily picked up on. Remember how as girls and boys we'd 'shadow' animals on walls? It was probably one of the few occasions when darkness held no fears for us. Article in the Decaan Herald, 5th February 2015. This winter, a workshop with Drew Colby introduced us to the complex yet familiar world of hand shadows. While most people have had a go at hand shadows already, achieving a wide variety of animate forms with simply a light source, a pair of hands and a surface is a secret art into which initiation is necessary. In preparation, Drew led us through a series of twenty hand warm-up exercises – some familiar and others new, some easy and others tricky coordination conundrums. He gave a short performance with a minimal set-up consisting of a torch and a photographer's round diffuser screen mounted on a light stand. Bears, birds, seas, rabbits, people and many other figures peopled the screen in a dreamlike sequence. Then we got to try our hand at it, so to speak, with Drew's guidance. We made spiders, crabs, camels and pigs as well as the more obvious birds and rabbits, and the bum-wiggling bear. Some came more easily than others and not being directly between the light source and the wall made it even harder, as the shadow warped obliquely out of shape. We discovered that some people had crazily supple wrists and fingers and that each individual’s hands and rhythms gave a huge variety, even when we were all trying to produce the same thing. Our creatures had personality! Some figures appeared easily and spontaneously, only to escape and return reluctantly only after a frustrating chase. The shadows are very sensitive, and it is only with daily practice, as Drew pointed out, that they come easily and reliably. Hands, arms and backs became tired and time passed quickly as everyone was absorbed in the hunt for the duck, the mouse and the old man that were hiding in their hands. It was addictive work, and difficult to remember to stop and rest. In the afternoon we learnt about light sources – LED torches of 200 lumens and above were the preferred, affordable and versatile choice. Candlelight is also an interesting possibility. Screens can be a wall, cloth or something like the photographer's portable diffuser, which Drew was using. Hands can be behind or in front of the screen, as long as they are between it and the light source, and the performer visible or hidden. This is low-tech stuff and requires messing around to find your own way, suited to your project. The workshop revealed hand shadows to be a true art form requiring hours of committed practice to master, just like a musical instrument.